Claims that a republican group abandoned a massive van bomb in a border village this week proved unfounded after a dramatic controlled explosion by the British Army revealed the van to be empty. The alert took place on a bridge in Clady, which straddles the border between Counties Donegal and Tyrone. A van had been parked on the road, and left with its hazard lights flashing. Following the van’s destruction, the incident was described as an “elaborate hoax” by crown forces. In a separate incident this morning, a small device exploded underneath a car in east Belfast. The device was said to have caused slight injuries to the partner of a member of the PSNI police, the apparent target of the attack. No group has claimed responsibility for either incident, which have fuelled renewed tensions over dissident attacks in the North. Ulster Unionist councillor Derek Hussey said he “unreservedly condemned” the disruption caused by the Clady bomb alert. “The closure of a cross-border road has caused a great deal of traffic disruption” he said. 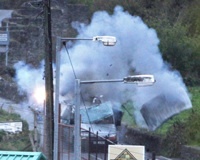 West Tyrone Sinn Fein MP Pat Doherty said local residents were “apprehensive”. There were also condemnations of the incident in east Belfast, which took place less than half a mile from the giant Crown force complex at Castlereagh. Damage could be seen under the front of the vehicle, a valuable red MX5 sports car. The PSNI later erected screens to prevent onlookers watching them as they carried out an inch-by-inch search of the scene. “This is a quiet residential area and if it is the case of a police officer being targeted, I think it is a very serious development,” said Ulster Unionist leader Reg Empey. In other incidents around the North, dozens of office workers were evacuated during an alert in central Belfast on Wednesday morning. A suspicious package was said to have been left inside an office block beside the Europa bus station, but nothing was found. Additionally, a caller rang a Belfast newsroom to say a suspicious device had been left near a garage on the Stewartstown Road in Belfast, but again nothing was found, while there was also a false alarm in Limavady, County Derry. This morning’s attack was considered unusual in that it took place in Belfast city and also involved a successful detonation. Located in a strongly unionist area, there were also suggestions that loyalists may have been involved. “This is a very serious development, it clearly shows the intent of those responsible,” said Ian Paisley Jr.
“If it turns out to be dissident republicans, it confirms the view that they’re prepared to go to any length to either kill a police officer or someone else in the community to make their point,” he said.